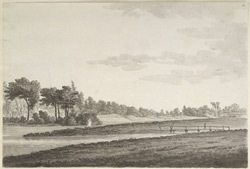 A view in ink of the junction of the Rivers Thame and Isis near Dorchester in Oxfordshire, drawn by S.H. Grimm. This point at Dorchester-upon-Thames is where the River Thames proper begins. The River Thame rises near Tring in Hertfordshire, then flows through the Vales of Aylesbury to Dorchester. It meets the Isis and then flows down the Thames Valley to London.